The discovery of large natural gas reserves under the waters of the eastern Mediterranean could potentially mean a huge economic windfall for Israel and Lebanon, both resource-poor nations — if it doesn't spark new war between them. The Hezbollah militant group has blared warnings that Israel plans to steal natural gas from Lebanese territory and vows to defend the resources with its arsenal of rockets. Israel says the fields it is developing do not extend into Lebanese waters, a claim experts say appears to be correct, but the maritime boundary between the two countries — still officially at war — has never been precisely set. 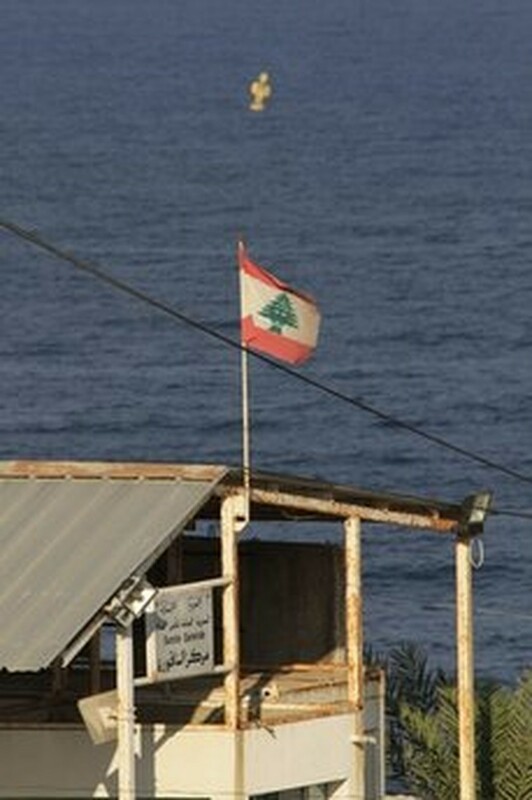 In this photo taken Friday, July 23, 2010, a buoy placed but Israel near the Lebanon-Israel water border, that wasn't recognized by lebanon and the U.N., seen in front of a center for Lebanese general security in the southern coastal town of Naqoura, Lebanon. The threats cast a shadow over what could be a financial boon for both nations, with energy companies finding what appear to be substantial natural gas deposits in their waters. Israel is far ahead in the race to develop the resources. Two fields, Tamar and Dalit, discovered last year, are due to start producing in 2012, and experts say their estimated combined reserves of 5.5 trillion cubic feet (160 billion cubic meters) of natural gas can cover Israel's energy needs for the next two decades. In June, the U.S. energy company Noble Energy, part of a consortium developing the fields, predicted that Israel will also have enough gas to export to Europe and Asia from a third field — Leviathan, thought to hold up to 16 trillion cubic feet (450 billion cubic meters) of gas. Israel relies entirely on imports to meet its energy needs, spending billions to bring natural gas from Egypt and coal from a variety of countries. So just freeing the country from that reliance would have a major impact. When Tamar begins producing it could lower Israel's energy costs by a $1 billion a year and bring $400 million a year in royalties into government coffers. That suggests a total of about $40 billion in savings and $16 billion in government revenues over the total yield of the field. Those numbers would only rise as Leviathan comes on line. "Israel's always looked for oil," said Paul Rivlin, a senior research fellow with Tel Aviv University's Dayan center. "But I don't think it ever thought of itself as becoming a producer. And now that you've got a high-tech economy that's doing quite well, this comes as an added bonus." Hezbollah's warnings, however, quickly followed the announcement by Houston, Texas-based Noble Energy. Lebanese parliament speaker Nabih Berri, a Hezbollah ally, warned that Israel is "turning into an oil emirate while ignoring the fact that the field extends, according to the maps, into Lebanon's territorial waters." Israel's Petroleum and Mining commissioner at the National Infrastructure Ministry Yaakov Mimran, called those claims "nonsense," saying Leviathan and the other two fields are all within Israel's economic zone. "Those noises occur when they smell gas. Until then, they sit quietly and let the other side spend the money," Mimran told the Israeli daily Haaretz. Maps from Noble Energy show Leviathan within Israel's waters. An official with Norway's Petroleum Geo-Services, which is surveying gas fields in Lebanese waters, told The Associated Press that from Noble's reports there is no reason to think Leviathan extends into Lebanon. The official spoke on condition of anonymity because he was not authorized by his company to speak on the subject. The rumblings are worrisome because Israel and Hezbollah each accuse the other of intending to spark a new conflict following their devastating 2006 war. That fighting, in which Hezbollah's capture of two Israeli soldiers in a cross-border raid sparked a massive Israeli bombardment, killed about 1,200 Lebanese and 160 Israelis. Since then, there has been a rare interval of peace. Hezbollah, a close ally of Syria and Iran, has not fired a rocket into Israel since. Israeli officials, however, say they believe Hezbollah has managed to triple its prewar arms stockpile to more than 40,000 rockets. The warnings from Hezbollah and Berri could be as much for domestic consumption as directed as Israel, aiming to press for the passage of a long-delayed draft oil law, needed before any Lebanese fields can be developed. Oil and gas exploration has been a source of disagreement between Lebanese politicians over the past decade. The change of several governments and disputes over what company should do the surveying have caused delays. In October, Petroleum Geo-Services said fields in Cypriot and Lebanese waters "may prove to be an exciting new province for oil and gas in the next few years," noting signs of deposits in Lebanon, though their size is still not known. "It is very encouraging for Lebanon," the PGS official told AP. Any finds could help Lebanon's government pay off what is one of the highest debt rates in the world, at about $52 billion, or 147 percent of the gross domestic product. Israel and Lebanon are among the few countries in the Middle East without substantial, lucrative natural resources. Israel has built a place for itself with a powerful high-tech sector, while Lebanon has boomed in recent years with tourism and real estate investment. While the gas may not transform them into Gulf-style spigots of petro-cash, it would be a major boost. Rivlin doubts Israel could become a significant exporter, saying nearby countries don't need or aren't willing to buy from it, and the costs of liquifying gas for transport to further markets like Europe may be prohibitive. But Eytan Gilboa, a political science professor at Bar-Ilan University, said that with the world "so hungry for energy," Israel won't have a problem finding buyers. But the development raises security worries, as the offshore gas infrastructure could become a target. During the 2006 fighting, Hezbollah succeeded in hitting Israeli warships off Lebanon with its rockets. "Once those rigs start producing gas, it's going to be difficult to secure them," Gilboa said. "So on the one hand, you reduce dependency on imports in times of crisis, but at the same time, you make yourself vulnerable because those sites are exposed."